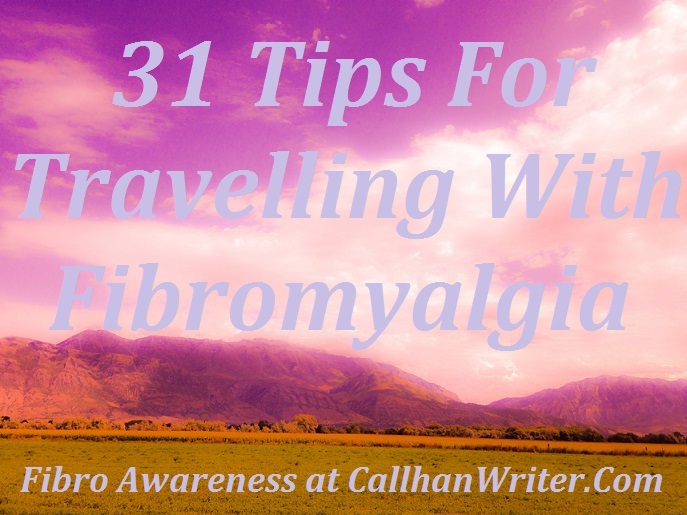 31 Tips For Traveling With Fibromyalgia | Troy C. Wagstaff aka CallahanWriter Blog: Topics of interest include Western Historical (1865-1899) Topics. Additionally inspirational Christian and Fibromyalgia interests. There is a lot to consider when traveling with fibromyalgia. In the Traveling with Fibromyalgia Part ,1 I covered some of my experiences of traveling in a car. Road trips are doable with the right preparation. Any travel is possible for a fibro fighter with proper considerations and planning. This time, I am going to write about experiences and lessons learned about traveling by air plane. In addition, this article talks about traveling in a larger group. My last vacation was just me and my wife on a road trip to Yellowstone. The size of your traveling party can be a important consideration. I hope my experiences help other fibro fighters in their desire to travel. This trip was flying to California with family and friends. I went on this Disney Land vacation with my wife, Colette and two of our three daughters. One of my daughters was accompanied by her best friend. My wife’s best friend also flew out with us. She was on vacation with us and finished her vacation by going back to California with us and then went home a few days later to northern California. My youngest daughter met her best friend at our hotel. She had moved to California a year previously. Wendy, our California friend, suggested I request a wheel chair at the airport. We thought that was a good idea. It wasn’t. Because of the wheel chair we boarded first. That was nice but no big deal. When we arrived at Long Beach we got off last. No big deal. Going through security was a huge deal. Because I was in a wheelchair, I didn’t have to go through the metal detector but the pat down very invasive. If someone would have done that without a uniform it would have been sexual assault. Getting off the plane in Long Beach wasn’t so bad. They have a very small airport so I could have easily walked around. In future airplane trips I declined the wheel chair at the airport. It was more effort than it was worth for me. Lesson learned. There were in all, seven in our party for the first few days. The last half of our vacation was five of us. At first glance, traveling with a large party sounds daunting for a fibro warrior. It wasn’t at all bad. In many cases it turned out very good. Everyone had someone to be with which took off pressure for me to be out and about. They wondered how I could have fun without going at the hectic pace they were going. It suited me fine. I really could take my time and not interfere with anyone having fun. Let’s start from the beginning. While planning our vacation we applied the lessons learned from the trip my wife and I took to Yellowstone. We didn’t over plan activities. Our hotel was literally right across the street from Disneyland which was the main focus of our trip. We got five day passes so we could come and go to Disney Land as we pleased. My daughters had their friends, my wife had her friend and I had a couple of books and my laptop. Our hotel didn’t have private hot tubs but they had an outside hot tub by the swimming pool. I brought sun screen and a couple of books so I wouldn’t get bored. I wish I had brought some videos or DVD’s. Streaming wasn’t what it is today. Lesson learned. We like to get our moneys worth but when planning we realized I may not use my pass to Disney Land five times but that was part of managing expectations. I ended using it three times which was just about perfect for me. My wife and I knew about my situation and the need to manage expectations. We told our kids about the expectation concept and they didn’t seem to care since they would have friends along and it was established that they would be on their own in Disney Land most of the time. When we could, we would eat lunch and dinner together. Everyone would get up and go the continental breakfast early in the morning. I slept. I’ve never understood why people on vacation want to wake up so early. Among other things, vacations are a time to relax. Even more so when traveling with a chronic illness. I would get up and eat enough to take my meds. With no rush, I would get ready for the hut tub. I spent one or two hours in the hot tub each day. Sometimes I would get lunch from the hotel restaurant. Thank goodness for cell phones. After lunch I would call my wife and we would plan on where and when to meet at Disney Land. I couldn’t go on many rides. This trip was four or five years ago. I don’t remember many rides I went on but I do remember what became my favorite ride, it was in The California Adventure park across from Disney Land. It was called California Dreamin’. I went on that ride five or six times. I got the sensation of moving but not fast and jerking. There was no spinning, it was smooth. We were told my several people who had been to Disney Land recently that you could rent wheel chairs and motorized carts. On the first day I went to Disney Land I went to the rental place and found that they were out of carts. I decided a wheel chair would be better than walking. I was wrong. While It keep pressure off my feet, it put a lot of wear and tear on my arms, neck and shoulders. Wendy and Colette ended up pushing me around the rest of the evening. Luckily, the rest of the trip I got a motorized cart. Lesson learned. The single most important detail of that trip was the use of motorized carts. It was great. Not only did I get around easily, I meet several other disabled people and about half of them also had fibromyalgia. We would talk about what rides were good to ride and what rides we should consider avoiding. Whoever was with me got to go to the head of the lines on every attraction. My wife has neuropathy in her feet from two types of chemotherapy and diabetes. She saw how great the carts where and decided to rent one on her last couple of days at the park. Some of our fun at the parks was racing each other. Later we went to Knots Berry Farm. It was small so our late arrival didn’t matter. We also went to a restaurant called medieval times that was near Knots Berry Farm. That was fun but that day with two major venues was exhausting and our only real scheduling problem. On our driving around from place to place or at the end of the day we would go to the beach. It was the last couple of days in October and first few days of November. The water was cold but the sights and sound of the Ocean were spectacular. I spent a lot of time resting and soaking in the hot tub. I spent most days with the tens machine on my back. I slept on my heating pad. Don’t worry, I have a great heating pad with a lot of settings including a built in timer and a built in maximum temperature. Because we learned and applied our ‘lessons learned’ from previous traveling we made this trip more enjoyable and less physically draining. We flew home late in evening. Getting home late at night was tough but it seems impossible to make every aspect perfect for an illness that is unreliable. I took about three or four days recuperating. For me, the wheel chair at the airport wasn’t worth it. The wheel chair at Disneyland wasn’t worth it. The motorized carts were well worth the money. We also learned that there are rentals in the Disney Land area that will deliver motorized carts to your hotel door and they cost less than Disney Land. Even though you plan on rest time and have a low key itinerary there will be days that you over do it. You can’t schedule good days and bad days with fibromyalgia. From my personal travels which aren’t much and through the experiences of others with fibromyalgia at the Fibro Family Christian Support Group on Facebook, here is an extensive list of things to do and things to consider taking with you when traveling with fibro. 1. Don’t be negative but know your limitations. 3. List of allergies and a list of illnesses and which meds are used for which symptoms. 4. Take three extra days of medicine. 7. Plan ahead for things you may need like an electric scooter or wheel chair. 8. Plan for the flight, the check in time, and security lines. Give yourself more time than you normally would. 9. Consider what is realistic when planning your vacation. 10. Always consider hot tubs. 11. Always plan for rest time. 18. Don’t be afraid to stop and rest as needed. 19. Generous use of pillows if needed. 21. Preparation. But remember that with all the preparation you make you can’t plan for rough days or flare ups. 24. Pics of pill bottles. 25. Plan on rest days. 27. A handicap parking placard. 28. Anticipate med. refills before you travel. I use Wallgreens which gives me access to my pharmacy records and refills if I mess up with my medications. Troy Wagstaff © Copyright, All right reserved.